To load a file press the "Add data" button, select "Load file" and choose the type of file you want to load. * To load from an SQLite data file create a database connector first. See Loading from databases for details. Alternatively, you can load a file is by simply draging it into EasyMorph. In this case EasyMorph automatically creates a new import action depending on the file extension. 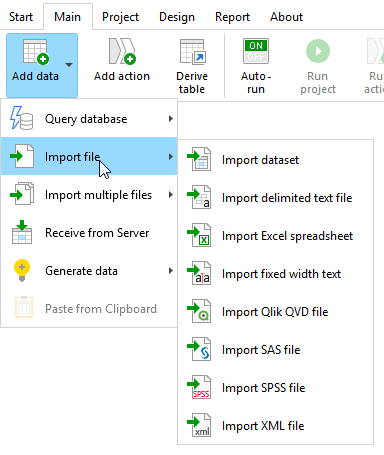 Extensions that are recognized automatically: xls, xlsx, txt, csv, psv, tsv, qvd, sas7bdat, dset. You may need to adjust settings of the created import action in order to load the file correctly — e.g. choose a separator, or pick only particular columns. Hint: When you load multiple files into multiple tables it may clutter your workspace. To reduce clutter move tables to different tabs. To move a table to another tab create a new tab, then right-click the table tile bar and choose "Move to another tab", or press Ctrl+M. While it's always possible to concatenate multiple tables into one using the Append" action, it may be inconvenient when many files have to be loaded. In this case, instead of appending tables explicitly, it possible to load multiple files and automatically concatenate them into one table. The files must be uniform — e.g. they must of the same type and have the same set of columns. 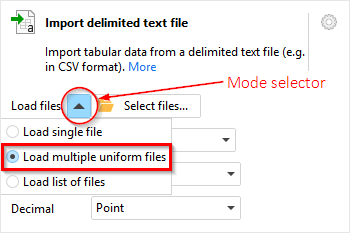 To load several uniform files use the multuple load mode which is available in any file import action. 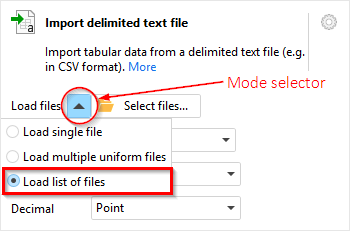 Explicitly select particular files to load. Select all files that match a search criterion such as search string, wildcard, or regular expression. Hint: To quickly load multiple files from a folder, drag and drop the folder into EasyMorph. A necessary file import action will be created automatically. This will work even if the folder contain files of different types — EasyMorph will offer you to pick a file type to load. Obtain a list of files using the "List of files" action. Filter the list of files. Load all files from the list into one table using a file import action in the "Load list of files" mode. Obtaining a list of files is most frequently done using the "List of files" action. This action generates a table with a list of files in specified folder. The list can include not just file paths, but also file size, creation date and extension. There are other ways to produce a list of files in EasyMorph. For instance, the "Fetch email" action receives emails and saves their attachments into a designated folder, returning a list of saved files. Hint: To quickly produce a list of files in a folder in EasyMorph, drag and drop the folder into EasyMorph. The "List of files" action will be created automatically. The list of files to load can further be filtered using one or more filtering actions. For instance, you can keep only files which size is greater than 10'000 bytes. See also chapter "Filtering data" in this tutorial. Finally, use an appropriate file import action in the "Load list of files" mode and specify the column that contains the list of files. Note that the list should consist of full file paths, not just names. If the file(s) to load are too big (e.g. hundreds of gigabytes) and can't fit in memory then you can split them into chunks first, and process one chunk at a time. The "Split delimited files" action splits text files into chunks based either on number of rows (used for files with fixed width columns), or unique values in particular field (i.e. partitioning of delimited text files). The action returns a list of created files (the chunks), which can further be used for iterating.